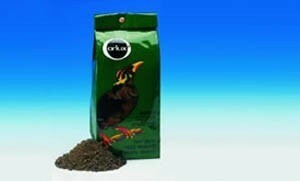 MYNAH FOOD is a complete nutrition for mynahs and other fruit eating birds. - relative to the composition, the specific needs of these birds were closely kept in mind. ORLUX MYNAH FOOD contains a fruitmix of apricots pineapple, apple, raisins and exotic fruits - a low iron percentage prevents liver degeneration.